The Herald newsroom workers are under attack, and that matters. KJIPUKTUK (Halifax) - The Chronicle Herald newsroom is shrinking, yet it is expanding its marketing and promotional divisions and investing in weekly papers all over the province. And while management created a new newsroom management position, and hired non-union sports and photo editors, other newsroom departments remain chronically understaffed. Meanwhile two news bureaus, in Bridgewater and Yarmouth, stand empty. The union is in conciliation talks today and tomorrow after management walked out of face to face collective bargaining negotiations that lasted a mere three and a half days and never even touched upon monetary issues. “The company is asking for some pretty massive concessions. The ability to contract out, changes in severance language, and they told us at the start of the talks that they plan to lay off staff,” Ingrid Bulmer, president of Local 30130 HTU, told the Halifax Media Co-op in November. 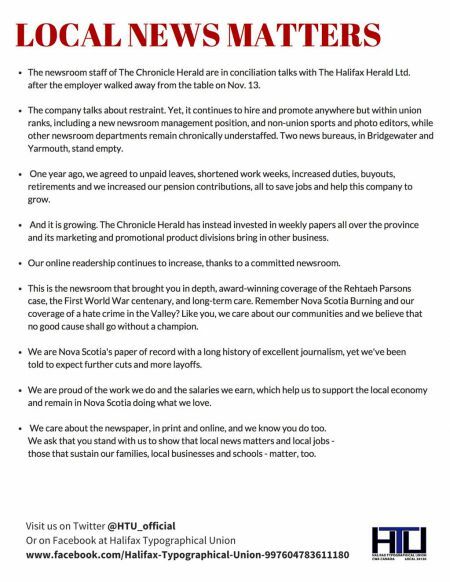 In a separate move the Chronicle Herald Ltd. is also seeking to freeze the defined benefit pension plan that covers all its workers. Halifax Media Co-op readers of the Chronicle Herald will all have their own examples of flawed reporting. The Chronicle Herald is an irritating newspaper. And frequently not in a good way. But, as the HTU leaflet points out, it’s also a good paper. The simple fact is, the Chronicle Herald has the largest newsroom in Nova Scotia. There may have been a time when the publicly-funded CBC could contest that claim, but after years of cuts that’s no longer the case. There is no way we would know what is happening at the Legislature or in Truro or Digby, to the extent that we do, if it weren’t for the Herald reporters. Just now I tweeted an excellent story in today’s paper on a paramedic’s encounter with a deeply flawed mental health system in Cape Breton. So that is why we must support the Chronicle Herald newsroom worker in their fight with management. If you don’t buy that, know there are days I don’t buy it entirely either. Here then is reason number two. The Chronicle Herald newsroom workers are workers. They are getting screwed by their employer. An employer who earlier this year ruthlessly locked out 13 pressroom workers who opposed a wage freeze. An employer who forced “voluntary” (but unwanted) early retirement or buy-out packages upon 13 newsroom staff. 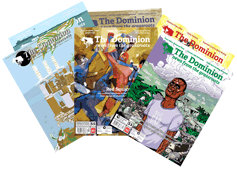 “We are proud of the work we do and the salaries we earn, which help us to support the local economy and remain in Nova Scotia doing what we love,” the leaflet concludes. I will support that any time.